Nelson Chamisa addresses a news conference earlier this month in the capital, Harare. On Friday, Chamisa's opposition Movement for Democratic Change filed a legal challenge of the presidential election won by his opponent, incumbent President Emmerson Mnangagwa. The move marks a crucial development in the dispute that has roiled Zimbabwe virtually since the moment polls opened in the election. The vote was heralded as the country's opportunity to finally escape the long shadow of Mugabe. Mugabe had governed with an increasingly iron fist during Zimbabwe's nearly four decades as an independent country — until the nonagenarian leader resigned last year under pressure from the military and Mnangagwa, a former ally in the ruling Zimbabwe African National Union-Patriotic Front. Mnangagwa, 75, took his place at the top and entered the elections as the incumbent president, running as a forward-looking candidate ready for a break with the country's authoritarian past. Events of the past week have reminded many of the old Zimbabwe, however. Before Mnangagwa was declared the victor — officially getting just over half the vote, besting Chamisa's 44 percent — Zimbabweans waited days to learn the results from the country's election commission. During that time, security forces fired live rounds on restive demonstrators angry with the long wait, killing at least six of them. Soldiers also patrolled the streets of Harare, and police raided the MDC's headquarters prior to the commission's announcement. And after the election, Tendai Biti, a leading opposition official who had denounced the results, was arrested and charged with fomenting violence. "We have documented groups of armed uniformed soldiers on a rampage, plainclothes police and also unidentified gunmen targeting senior opposition officials," Dewa Mavhinga of Human Rights Watch told NPR's Eyder Peralta on Thursday. At virtually every step, Mnangagwa has sought to publicly distance himself from the security apparatus he controls, including saying Friday that he personally intervened to see to Biti's release — after several international observers expressed their dismay at his treatment, including the U.S. State Department. "The United States government is gravely concerned by credible reports of numerous detentions, beatings, and other abuses of Zimbabweans over the past week, particularly targeting opposition activists," department spokesperson Heather Nauert said in a statement Thursday. "There should be no role for violence, intimidation, or harassment in the new Zimbabwe." Now, Mnangagwa's inauguration is on hold. 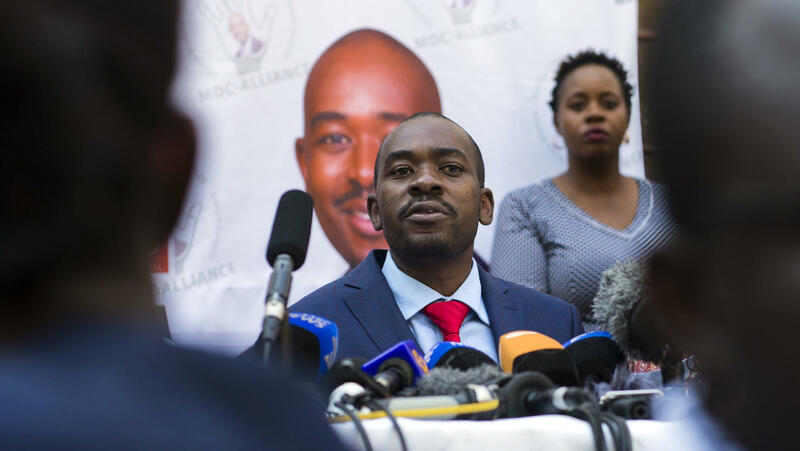 "On the basis of the evidence we have placed before the court, we seek in the main relief to the effect that the court should declare the proper winner and the proper winner is my client," Chamisa's lawyer Thabani Mpofu told reporters after filing the paperwork Friday, according to Reuters. "In the alternative, we seek that there be another election which complies with the dictates of the law. There is no inauguration that will take place until the matter is determined by the court." The Constitutional Court has two weeks to weigh the opposition's petition and render a decision. That decision is to be considered final.